Home > Ask Our Experts > How Close Can Gun Club Shoot Near Red Squirrels? We have a gun club immediately adjacent to our home. 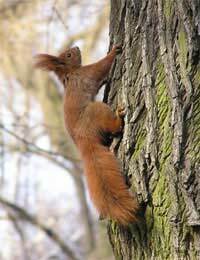 We also have a resident population of red squirrels. How close should gun club members be to our land when shooting? Are there legal boundaries? It is illegal for shooters to trespass onto private land without gaining prior permission from the owners. If shooting close to the boundaries of private land, shooters must be aware of the possibility that shots may ricochet and not travel in the intended direction. In this particular situation, it could be possible for shots to ricochet off trees and accidentally strike a red squirrel, so precise shooting would be necessary. As has already been hinted at, you cannot legally trespass onto private land. This means that even if any of your pellets accidentally enter private land, you cannot legally enter that land to retrieve them without first gaining permission from the owner. Although this is less commonly known, it is also considered trespassing if your pellets do enter private land, as you do not have permission for them to be there. If shooters trespass onto your private land without getting your permission beforehand, this is deemed to be a criminal offence. If they trespass onto your private land with a gun, this will usually be considered as trespassing whilst in possession of a gun/weapon. A typical fine for trespassing onto private land with an airgun is three months in prison and a fine of up to £2500. Under the terms of the 1981 Wildlife and Countryside Act, it is not acceptable for a shooter to target any type of 'vermin' wildlife that he wants to. Instead, there is a legal protection on most types of wildlife, which means that they can only be targeted by individuals who have the legal authorisation to do so. Even though the wildlife in question may be widely regarded as a 'pest', it is illegal to shoot them without being legally authorised to do so. If a shooter does have the necessary authorisation, acceptable targets include certain types of birds (including woodpigeons, feral pigeons, collared doves, magpies, jays, rooks and crows) and certain types of 'vermin' wildlife (such as brown rats, grey squirrels and rabbits). Grey squirrels are often targeted to 'save' red squirrels. I have two acres in scotland. I rent the main out for horses and use it Also to train my dog. It is fenced and there is only One gate. Last sunday shooters came without warning Or permission, climbed the fence and strolled right thru With spaniels on the loose. I was disgusted. Had to keep my dog and cats In all day. NOT convenient, not safe. What is the law regarding This? I realise that speaking to the manager would lise me Friends locally. Can i put up a sign? !